Tigard beaver removal is common on the outer parts of town, but if you live near water there is a good chance you might have a beaver problem at sometime. Beaver control is a very specialized process and requires knowledge and certain equipment. We have bee solving beaver problems for over 30 years and can help you quickly solve your problem. Beaver's can cause a lot of damage by backing up water and cutting down trees. The teeth on a beaver never stop growing so they have to chew on things to grind down there teeth. This can create a problem for you if you have beaver damage at your property because they will never stop chewing. We have many different methods for solving beaver problems and it all depends on the location. 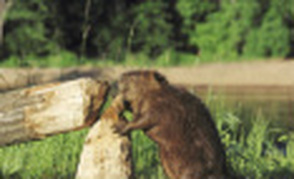 If you have a beaver problem in Tigard, give us a cal and we can talk about the best options for solving your problem. For Tigard Beaver Removal Call 503-201-2432 Today!